COLUMBUS, OH — #6 Denver Love Tractor pulled away from #10 San Francisco Polar Bears to win the Elite-Select Challenge, on the back of five straight breaks in the second half. It was a dominant performance to cap off another undefeated tournament, despite the challenging conditions and shifting format. Elsewhere in Columbus, the bid picture for Nationals flipped on its head, with several teams rising up the rankings, and others falling out. Throughout the weekend, Denver Love Tractor found themselves under pressure at every turn. Coming in with a target painted on their backs, Love Tractor withstood challenges from teams hunting for bids for their regions. A double game point scare from #24 Iowa Chad Larson Experience kicked off the weekend for the Denver squad, and a string of close victories followed after that. In pool play, and all through the semifinals, the team focused on setting and running their vertical stack offense to perfection. Love Tractor showed they could win close games and put away opponents while running their system. In the final against Polar Bears, though, the team broke out several new wrinkles. To step back a bit, all across the division, side stack isolation pull plays were the most popular ways to jumpstart an offense. Love Tractor, throughout the Pro-Elite Challenge and most of the Elite-Select Challenge, had eschewed that strategy. Love Tractor’s offense was focused solely on their vertical stack. It worked well in Colorado, but it looked like teams were starting to figure it out in Ohio. Love Tractor was prepared this time around. Denver opened the game with a side stack isolation play, flipping the script on teams expecting another vertical attack. On their third offensive point, Love Tractor opened in a horizontal stack. All of this was by design. “After Toner commented so many times about our stack at Colorado Cup, we had to switch it up. We’re trying to introduce some more variety,” said captain Jack McShane after the final. It certainly helped keep the Polar Bears defense off-balance. 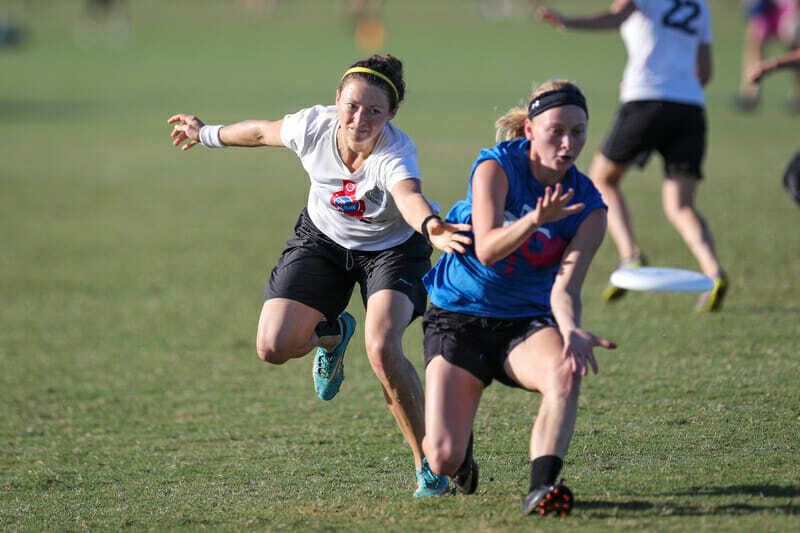 While the new looks were not necessarily as polished as their primary system, with another four weeks of practice before Regionals, expect Love Tractor to have the offensive variety to stay out in front of their South Central rivals. In all, it was another strong performance from a surprise contender in the mixed division. McShane saw plenty to be encouraged by this weekend. “[I was encouraged by our] D-line offense for sure. I think we struggled a few times at previous tournaments to convert breaks. We can get turns, but we’ve struggled to convert breaks,” he said. “Obviously there was not much turnaround time between the U.S. Open and now, but we focused on what we could on the D-line’s offense and it worked out well.” With two breaks to close out the first half, and five straight to win the tournament in the second, the newfound capability to earn breaks in bunches puts Love Tractor squarely in the driver’s seat for the South Central. With all the team’s success this year, however, they know teams can gameplan for Regionals and Nationals. McShane recognizes this, but isn’t worried. Moving forward, he said Love Tractor “may add a few new things that teams haven’t seen…but as long as we execute, we aren’t concerned about teams knowing what the plays are.” Love Tractor proved at both the Pro-Elite Challenge and the Elite-Select Challenge that they can play with some of the best in the division. While the South Central sits with just a single bid to Nationals, based on their performances this year, that spot is Love Tractor’s to lose. The Southwest region was stuck at a single bid to Nationals going into the Elite-Select Challenge, with traditional powerhouses like #9 San Francisco Blackbird and #14 San Francisco Mischief on the outside looking in. This has become the new normal for the Southwest, dropping from a peak of five mixed bids to Nationals in 2014 to two since then. With so many good teams in the Bay Area in particular, that always meant one deserving team had to stay home in October. This year, the trend could be turning around. All three Southwest teams in Columbus needed to put up good performances to earn bids, and they delivered. San Francisco Polar Bears put out a convincing product this weekend, riding an athletic defense to a dominant win over Mischief in pool play, and getting breaks at the right time in the semifinals against a surprising #13 Minneapolis No Touching! team in a run to the final. According to Kate Schlag, Polar Bears’ roster consistency this year helped fuel the resurgence. “This is one of the first years we’ve had almost all returners to the team, as opposed to fighting through over 50% turnover, so I think we’re a lot closer as a team. That’s helped us learn to play for each other, instead of trying to shine individually,” she said. It was easy to see that this team has excellent chemistry with one another, and seemed to play on autopilot. With a tight offensive rotation, Polar Bears ran off more one- and two-pass scores than most of the teams in Columbus. With a defense that can grind down their opposition, that’s a recipe for success on the National stage. Blackbird returned to their winning ways as well, after a shaky start to the year at the Pro-Elite Challenge. Underseeded in Columbus, the San Francisco team had the opportunity to play two out-of-region teams in pool play who were ahead in the rankings, and they took advantage of their opportunity. Kicking off the weekend with a good win over #16 Fort Collins shame., revenge for a loss in Colorado, they followed up with a victory over an athletic but inconsistent #22 Madison NOISE team to solidify their spot in bid territory. Captain Ryo Kawaoka mentioned the need to learn to win as a team as a goal for the weekend. The team treats each tournament they play in as a chance to practice as a unit, looking to improve and build towards the series. With so much turnover from last season to this one, they needed to garner some experience winning together. Playing with a smaller roster than many of their competitors, it forced the squad’s new players into more prominent roles. Blackbird also started leaning on their stars a bit more. Malina Wiebe and Mac Taylor put on dominant cutting performances all weekend. “After Revolution, we needed to rethink how we were using certain players on the field, and one result was emphasizing getting Mac Taylor involved more in the offense and on defense,” said Kawaoka. That emphasis was clear from the start, as he played many back-to-back points and spent time shadowing the top offensive options for Blackbird’s opponents, while also igniting his team’s offense. That emphasis occasionally resulted in throws into double- or triple-coverage, but Blackbird tightening their offense is scary news for the rest of the Southwest. Mischief may be the forgotten team in the region, but they delivered as well this weekend. Despite a rough 13-5 loss to Polar Bears to open the tournament, wins over #21 Durham Toro and CLX gave the team the rankings boost they needed to sneak into a potential third bid for the region. With shame. moving in the opposite direction, Mischief capitalized on their chance and took ninth in Columbus. Four straight wins to close out the weekend, plus a tournament win at Revolution, should be the confidence boost the team needs to make another run at Nationals. With shame. and NOISE falling at the hands of Blackbird, the South Central and North Central region’s losses were the Southwest’s gain. With so few games left before Nationals bids are finalized, expect the Southwest to show up strong in San Diego. No Touching! will have played an impressive number of tournaments for a mostly Masters-eligible roster. The team will have battled through the Pro-Elite Challenge, the Elite-Select Challenge, and the Pro Championships by the time Regionals rolls around. Closing the weekend with a fourth place finish, they’ve had a lot of success against tough competition. They’ve also been lucky on the injury front this season, and if they can stay healthy through the postseason, get ready for some jorts and bananas in San Diego. Boston League of Shadows fell back to earth this weekend, posting a single double game point win against Pittsburgh Alloy. This is still a young, athletic team that can give any team a run for its money when they’re clicking, but it seemed like tight handler defense and aggressive marks disrupted the League of Shadows rhythm more than we expected. If they can take the lessons learned from Columbus into Sectionals and Regionals, expect an exciting finish to the season in the Northeast. The Madison NOISE darks were the best jerseys I saw all weekend. The subtle shades of blue are, in my opinion, the right way to do sublimated jerseys. Comments on "Elite-Select Challenge 2018: Tournament Recap (Mixed)"